Be the first to share your favorite memory, photo or story of Leander . This memorial page is dedicated for family, friends and future generations to celebrate the life of their loved one. 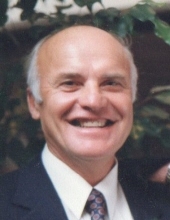 Leander “Lee” Raymond Kultgen, age 83 of Random Lake, was called Home on Thursday evening, June 9th at Sharon S. Richardson Community Hospice in Sheboygan Falls, where he had resided the last ten days. He was born on April 3, 1933 in the town of Belgium, the second of six children born to Leo Kultgen and Ann Weyker Kultgen. He attended St. Rose Catholic School in Fredonia and graduated from Port Washington High School. He was drafted into the Army and served in Augsburg, Germany during the Korean War from April 20, 1953 until March 17, 1955. While in the Army he earned the rank of Corporal in Company C 793rd Military Police Battalion. He also took special training courses with the 101st Airborne Division. On November 9, 1963 he married Joanne Wagner at St. Rose Catholic Church in Fredonia. Lee and his brother Henry started K & K Construction and later Lee decided to start his own business, Lee Kultgen Construction, which he owned and operated until turning the business over to his son Todd in 1998. Mr. Kultgen was a member of Our Lady of the Lakes Parish - St. Mary’s Chapel Random Lake, The Holy Name Society, The Catholic Order of Foresters, VFW Post #5373, Warren Kane Post #410 American Legion, Charter Member/Officer of the United Snow Byrds and the Lions Club. He enjoyed watching all sports, but enjoyed playing golf, baseball, bowling and fishing the most. He also enjoyed playing cards and the slot machines. He found great pleasure watching and hearing about his two grandson’s baseball, soccer and basketball games and also their hunting experiences. Survivors include his wife of 52 years Joanne of Random Lake, one daughter Debbie (Steve) Kultgen of Random Lake: one son Todd (Kris) Kultgen of Batavia and two grandsons Kyle and Luke Kultgen both of Batavia. He is further survived by three brothers: John (Pam) Kultgen of Byron, IL, Henry (Judy) Kultgen of Fredonia and Paul (Bev) Kultgen of Random Lake, one sister Mary Schommer of Fredonia, two brothers-in-law Jerry (Dar) Wagner of Saukville and Neil (JoAnn) Wagner of Fredonia, two aunts Mary Poull of Port Washington and Clara Weyker of Dacada, nieces, nephews and other relatives and friends. He was preceded in death by his parents Leo and Ann, his in-laws John and Elaine Wagner, one brother Alfred Kultgen, one brother-in-law Ronald Schommer and a nephew. A Mass of Christian Burial will be held on Friday, June 17th at 6:30 PM at Our Lady of the Lakes Parish - St. Mary’s Chapel, 230 Butler Street Random Lake with Father Richard Cerpich presiding. Visitation will be at the church from 3-6 PM. Lee will be laid to rest on Saturday, June 18th at St. Rose of Lima Cemetery in Fredonia at 10:00 AM with Military Honors. In lieu of flowers, memorial donations in Lee’s name can be made to The Random Lake Ambulance or Sharon S. Richardson Community Hospice in Sheboygan Falls. The Eernisse Funeral Home, Belgium is honored to serve the family. Online condolences may be left at www.eernissefuneralhome.com. The family would like to extend a heartfelt thank you to Mueller Therapy and their therapist who worked with Lee and also to the in home private care givers we had. Without all of you, we would not have been able to keep Lee at home until the end. We also would like to thank Sharon S. Richardson Community Hospice and their staff for the comfort, support and compassion they showed to Lee and our family at the end. They helped to make this difficult time a little easier. To send flowers or a remembrance gift to the family of Leander R. Kultgen, please visit our Tribute Store. "Email Address" would like to share the life celebration of Leander R. Kultgen. Click on the "link" to go to share a favorite memory or leave a condolence message for the family.